Imagess & video coverage by Ratherbe.com - Bailey sailed an Exploder with J/Z boards and a custom Decksweeper sail from Bach Wilson / Carolina Sails. Bach is Bailey's friend also sailed the event and is planning to build a dedicated Decksweeper for C board As. Good to see new builders in the A-Class as we are seeing now in the F18, Check Ratherbe.com for videos by Stephen Hansen . Nick Bowers cut will be available later (Two drones were available). 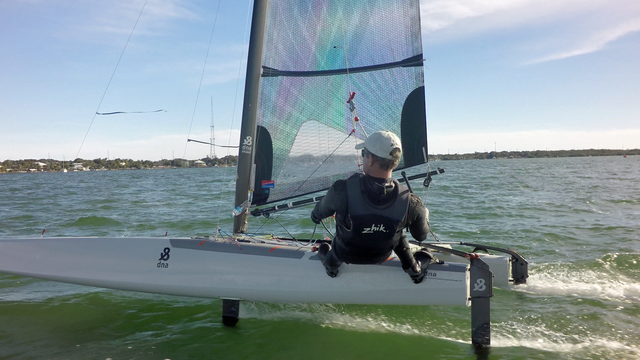 "The 2016 Ronstan Midwinters at the Upper Keys Sailing Club turned out to be much bigger than we expected and even more fun. What started with registration just breaking twenty turned into 35 boats as they just kept showing up on Friday. About 15 boats made a week of it and enjoyed flat water, mid teens winds, and warm tropical weather all week. work all around. They are already talking about next year. Skip Kaub and his finance Melania made the event possible by hosting enough boats at their home to keep things comfortable at the club. 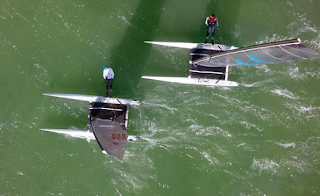 Thursday’s foiling clinic started with video and set up review at the club led by me. It was a good time for people to ask questions and share their insights on what was working and not working. A lot of talk on rudders, getting the boat up, etc. UKSC prepared several drills for both foilers and classics and got us all on the water but a storm system brought us in quickly. us until 2PM and we got in three great races in windy conditions that moderated as the day progressed. 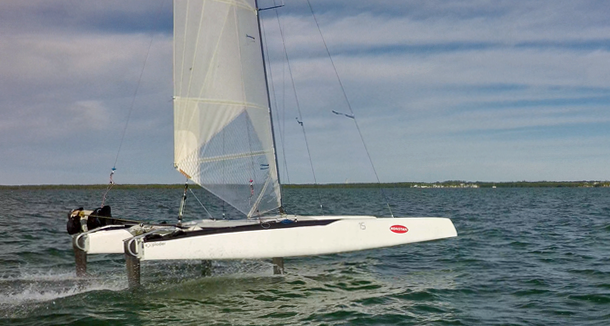 It was the first day for me to try a second prototype of a deck sweeper made by Carolina Sails. 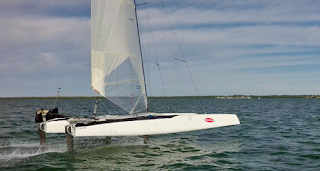 It is fairly flat and performed very well with good upwind speed and relatively stable foiling. Saturday was more of the same initially but conditions lightened. Matt Keenan continued to foil on his eXploder with Glaser DenBen in light conditions while the rest of us struggled to make it pay. He had more rudder lift in his setup. He got his first bullet in the A-Class in Race 5 and said it was his first win in 15 years! Matt is getting really fast, especially if he keeps the boat right side up. Woody Cope showed who is the boss with his first bullet of the weekend in Race 6 on the Nikita before the wind freshened a little again for me to pick up Race 7. A lot of very close racing up and down the fleet. A lot of smiles all around, even from Galt who at 16 was the youngest sailor at the event and also the only one to foil into a crash jibe and break his previously repaired mast. It will go to OH Rogers and be ready for the next winter event. Sunday started off with almost no wind, but created the perfect time for the Woods brothers to scatter their dad’s ashes on the start line. The Race Committee gathered everyone around as Larry spoke about his dad from his boat. Kevin and Gerard gave each sailor a flower to drop in the water as part of the ceremony. Really touching, and I have copied a few words two-time Olympic medalist Randy Smyth wrote about Larry Woods, Sr.
May I start by saying that your dad and I spent many of good times together on this planet. Recently, as fate luckily intervened, I was fortunate to have had a wonderful catch up conversation with Sr. just after the Atlanta A Cat event. Over the phone it was like nothing had changed, it was still the overachieving, forever optimistic, Larry I have always admired and now miss. His spirit added so much to Tornado sailing in its development days. The moment Larry arrived at a regatta the energy level immediately went up a few octaves. Whether he was flogging the latest Memosail starting watch or telling his exaggerated sailing story, it was always with giant enthusiasm. Although we kept in verbal contact and did meet in Bay City a few years ago, my lasting vision of Larry is of him jumping into his little diesel rabbit leaving a now vague Tornado Regatta probably somewhere in Florida towing his Tornado back to Canada many decades ago. Ronstan presented exceptional prizes to sailors across a large number of attributes from top female Laura Muma and best wipeout to Galt Oliver to top five in Classics and Foilers as well as Overall. Ronstan watches, Vavuud wind instruments, Robline, etc. Thank you, Ronstan and Ben Moon. Congratulations to everyone who sailed at the event. Next stop St Pete NOODs in two weeks for more palm trees and racing. RatherBe will be covering Miami Bacardi Race Week March 10 to 13.